There is no secondary obstruction or spider to reduce contrast in a refractor. The color (Chromatic Aberration) is nearly zero; far better than an f/10 achromat. The focal length is generous, making the observation of planets and the moon at high power easy with comfortable, long focal length eyepieces. The f/15 design is easier to focus. No need for a two speed focuser. This design is luxurious and generous. No need for expensive eyepieces either. This design delivers superb views with even the simplest ones. And, the eyepieces can be relative long focal length for the same power making the eye relief much more comfortable. 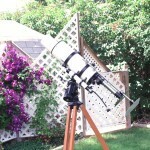 Some people say an f/15 refractor “beats the seeing”. Of course, it cannot defeat all the effects of seeing but it seems to achieve that because the defocus range is more generous. You are not tempted to tweak the focus all the time as you are with a shorter focal ratio scope.The forgiving optical behavior of such a scope reduces focusing problems when the seeing is less than ideal. Defocus due to atmospheric disturbance is less pronounced than in faster scopes. When using such a scope you don’t have to constantly readjust the focuser. You don’t need hyperfine focus and a multispeed focuser. A perfectionist will point out that the Chromatic Aberration (CA) is less than perfect in a 6 inch f/15. But, most people will never notice it, unless they are straining to see the very slight purple fringe around Jupiter or some such. The CA is far less than what is seen in a 6 inch f/10 or a 6 inch f/8. I have a six inch f/10 Jaegers which is a superb optic but the CA really bothers me. I don’t even notice any CA in my f/15. The most problematic characteristic of a 6 inch f/15 is the extremely long tube; about 90 inches (nearly 8 feet). Such a beast is notoriously cumbersome. 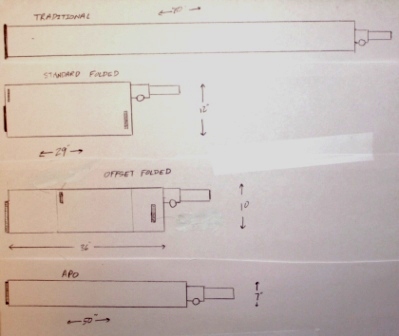 The tube assembly requires a robust mount on a tall tripod putting an equatorial head high above the ground. Handling heavy components above your head in the dark is no fun. Even with a big mount on a tall tripod, when looking at objects near the zenith you may be lying on your belly to look through the scope. The 6” f/15 is not an easily portable telescope. The long moment arm of this tube means that a very robust mount is needed to avoid having the scope twist in every breeze. The entire outfit is very heavy, cumbersome and expensive compared to a six inch reflector, making a six inch reflector a superior choice for the newbie. See The Perfect Telescope. 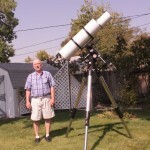 Nevertheless, a large proportion of experienced amateur astronomers love the views with long focal length refractors like the six inch f/15 so much that they are willing to deal with the problems. Many amateur astronomers chose to build an observatory for their big refractor because of the sheer size of the telescope. One solution that offers a more portable scope with many of the desirable attributes of a refractor is an apochromatic (APO) refractor. You get nearly all the attributes of a big refractor in a smaller package with a modern APO. The long tube has been replaced with one that is much more manageable, removing many of the associated problems. That is one of the reasons for the popularity of the modern APOs. These scopes put a color-free, high-contrast refractor image into a much shorter tube, perhaps 50 inches long rather than the 90 inches or so of an f/15. This makes the scope much more manageable and is an ideal solution if you have deep pockets. The downside of an APO is the high cost. These things are justifiably priced in the stratosphere. 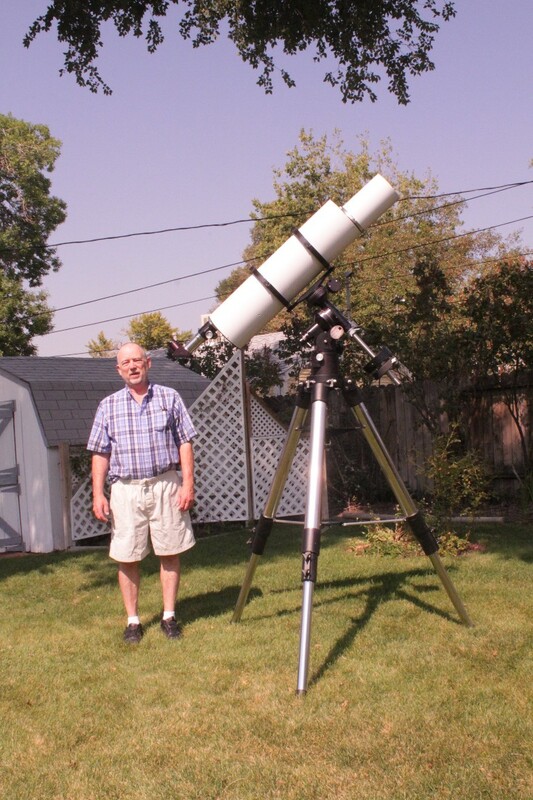 At $6000, a 6 inch f/8 APO is out of reach for many amateur astronomers. 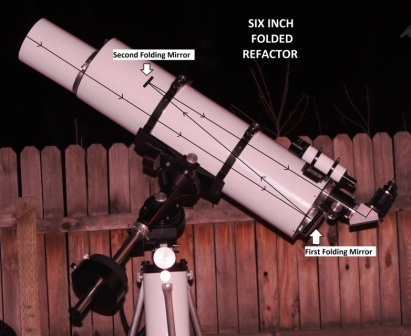 Another solution to the long tube problem is a folded refractor. Like an APO, such a telescope is designed to minimize the length of the tube, but it does it in a different way. The focal length remains the same at about 90 inches. But the tube length is reduced by folding that into three (or more) segments using high quality optical flat mirrors. As with all designs, there are compromises. 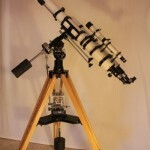 The flat mirrors add some cost and the telescope becomes more complex. The telescope is now short and fat. A Standard Folded refractor, such as the ones produced by Unitron fold the light path in three equal segments. This reduces the length of the scope substantially and makes such a scope much more manageable. This is a significant difference, especially in the larger apertures. It is difficult to overstate how big a change this makes to the usefulness of a telescope. The Unitrons (pictured) are both 3 inch f/15 telescopes. Even in this small aperture you can begin to see the advantages of the Folded design. Notice that the mount for the folded version does not need to be as robust; it’s the same as the one they used for the 60mm f/15 scope. There are many approaches to folding a telescope. See the LINKS below for some examples. The one I selected is what I am calling the “Offset Folded Refractor”. This design is much like the Standard Folded design which keeps the optical path parallel except that it makes one of the two folds a bit shorter. The overall length is proportionally a bit greater than the Standard Folded design (See Diagram). The advantage to the Offset Folded design is that the light path can be accommodated in a slightly smaller diameter tube. A Standard Folded design would put the 6 inch f/15 into a tube 12 inches in diameter and 29 inches long – short and squat. 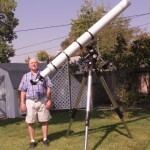 The Offset Folded Refractor is contained in a tube 10 inches in diameter and 36 inches long; still pretty short and squat but slightly thinner and a bit more compact. The following diagram illustrate the differences. Here are some representative values for a 6 inch f/15 refractor in various configurations and a 6” f/9 APO. The volume of the resulting tube is included for comparison purposes. It is clear that none of these folded designs results in a huge reduction in volume over a full-length Traditional configuration. The APO wins that competition hands down. The choice is obvious if sheer size is the only concern. But, like many people I cannot afford an expensive APO so that option is off the table. So what are the choices in folded designs? The Standard Folded design has a slightly larger volume but it is well worth that modest increase to simply reduce that horrible awkward length. It is shorter than an APO so it is a great choice. However, in the Offset Folded design the overall volume of the resultant telescope is reduced slightly from the Traditional and the Standard Folded designs. It still reduces the problematic length from an extremely awkward 80 inches to a much more manageable 36 inches. It is only seven inches longer that the Standard Folded and is even shorter than the APO! These are very good reasons for selecting the Offset Folded design. Here is a schematic view of the scope. But, how difficult is it to build such a telescope? How expensive? How much do the mirrors cost? Maybe as much as an APO? And what about the collimation? How do you adjust that second folding mirror when it is buried deep in the tube? Collimation must be a nightmare, right? Should I build one? These are all questions I asked myself before starting on this project. But, I only had to bump my awkward 80 inch refractor into a few stray tree limbs and doorways to be convinced that I needed a change. Lucky for me, no damage resulted from the collisions, but it was only a matter of time until the objective met the concrete. I resolved to change the situation. I love my six inch folded refractor. It is easy to handle and delivers classic refractor performance. Since I observe from my backyard in the suburbs of Denver, I am limited to lunar, planetary and double stars – not much deep sky stuff. Denver has notoriously bad seeing most nights, so the long focal ratio makes observing much more comfortable. On those rare nights of good seeing, I have observed exquisite detail on Mars, Jupiter and the Moon with this scope. Hubert Hermelingmeier has written a definitive paper on this subject. It is in German but the pictures tell the story quite well: http://www.privatsternwarte.net/Faltrefraktoren.pdf .